The Dexter ceramic sharpener was designed for durability and ease of use. The smooth ceramic rod is ten inches in length from the handle to tip. 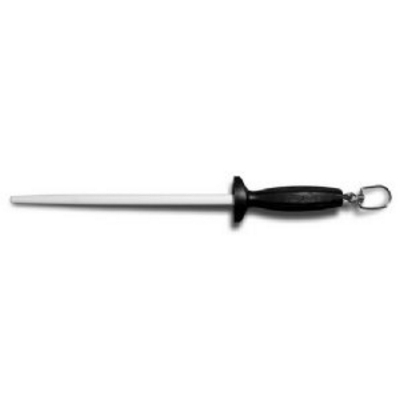 The rod is set securely in a durable, high-impact poly handle. Ceramic sharpener can break if abused. Dexter does not assume responsibility for breakage. Use the same conventional method of sharpening as you would with a butcher's steel. After each sharpening, wipe the blade of your knife clean. To keep sharpener clean, soak in a warm solution of any popular liquid detergent for a few minutes, or clean with a scouring powder and wipe clean.